History is the study of the past, it relates to past events as well as the memory, discovery, collection, organization, presentation, and interpretation of information about these events. History is about the truth, and it is about recording events and memories before they are consigned to be forgotten. Presented here in these sections is the History of the Indian Air Force. The unvarnished, un-revised version that is independent of jingoism and ultra-nationalism. Before the Indian Air Force was established in 1932, a group of Indian aviators marked their presence during the first world war. The Indian Air Force's History precedes World War Two by eight years. The IAF was established by on 8 Oct 1932 when its formation was announced in the Gazette of India. 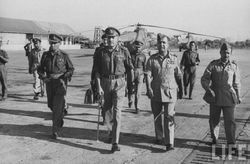 No.1 Squadron formed at Drigh Road in Karachi on 1 April 1933 with a complement of six Indian Officers under the command of a British Officer. The pages in this section showcase the initial years of the existence of the IAF. The Internet's best resource on the Indian Air Force in the Second World War. Read about veteran storiess, units, database research tools and the hundreds of photographs and images from that era! The WW2 Veterans Project : WWII Veteran Encounters, Profiles and Memoirs started off in earnest in 2002 when between a small group of like minded enthusiasts, an effort was made to locate and interview WW2 veterans of the Indian Air Force. With the dwindling number of veterans every passing year, the effort continues in terms of family members writing profiles of their loved ones who took part in the war - and in keeping their memories alive. The first test for the Independent Royal Indian Air Force came within months of August 15. The Operations of the 47-48 War were unique in the sense that this was the first time Transport aircraft of the IAF saw full time deployment in operations. Fighter squadrons also gained exposure and experience of operating in mountainous environment. The fifties saw the modernisation of the IAF. Coming out of the decade that saw the world war, the advent of new technology like JETS, the complete Indianisation of its officer corps, expansion of its infrastructure, all ensured that it was a hectic and busy period till the next decade which was filled with conflict all over again. In December 1961, the Republic of India undertook military action to evict the Portugese rulers out of the enclaves of Goa, Diu and Daman. This involved tri-service operations with the Army, Navy and the Air Force acting against the Portugese troops. The "war" was over in three days- resulting in the liberation of the Portugese enclaves. It also bought in a diplomatic freeze between the two nations which thawed only in 1974. Much before the IAF was involved in the conflict against the sub-continental rivals in the 60s, its first taste of action came in far away Africa, as part of a United Nations Force in Congo. Also read The Congo Diary - Flt Lt Charanjit Singh >Story from the eyes of another pilot from the first detachment. The Bharat-Rakshak site salutes the air veterans of the 1965 India-Pakistan War. We will be featuring articles and stories in the war including excerpts from the book "India-Pakistan Air War of 1965" over the coming months to commemorate the 50th year anniversary of the conflict. Early in May 1999, the Indian Army discovered large scale infilitration by Pakistani soldiers across the LOC in the Indian territory in the desolate Kargil sector. The operations to evict the mountain tops of the Pakistani army has now etched itself in living memory as 'Operation Vijay'. The Indian Air Force provided Battlefield close support , logistical supply and Casuality evacuation along with the Army Aviation Units. Three Officers and two airmen made the ultimate sacrifice. For its role in the ops, the IAF was awarded two Vir Chakras and 23 Vayusena Medals.